More than thirty influential transportation professionals representing federal and local government, the private sector and national organizations gathered in Boulder, CO, June 9-11 to focus on emerging new designs in bicycle facilities. The Bikes Belong Foundation hosted the workshop, which reviewed infrastructure innovations being pioneered by top U.S. bicycling cities such as Portland, OR, New York and San Francisco - all of which have seen dramatic increases in cycling in recent years. This unprecedented gathering featured the nation's leading bicycle planning and engineering experts working to make bicycling safer, more comfortable and more convenient. Bicycling in U.S. urban areas has grown dramatically in the last decade. Every community participating in this Bicycling Infrastructure Best Practices Workshop reported double-digit increases in the percentage of trips taken by bike. New York has engineered a 79% increase in cycling since 2006, while Portland's bicycle use has tripled since 2001. The development of new facility types adapted from international designs - such as bike boxes, bicycle-specific signals and protected cycle tracks - have helped fuel the rapid growth of cycling for short trips by creating appealing places to ride. The workshop featured updates on recent projects from many of the leading bicycling communities in the U.S., including the Non-motorized Transportation Pilot Program communities of Columbia, MO, Marin County, CA, Minneapolis, MN and Sheboygan County, WI. These communities have all received concentrated federal investment to increase the percentage of trips made on foot or by bike. "U.S. cities and counties are working at a lightning pace to make impressive improvements in their bike infrastructure," says Bikes Belong president Tim Blumenthal. 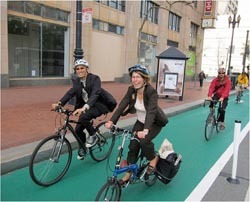 "These projects are making bicycling safer and more appealing for everyone - especially less-experienced cyclists. Convening urban transportation leaders to share best practices is a timely and important effort that Bikes Belong is happy to support." The host city of Boulder, CO - one of three cities to earn the League of American Bicyclist's highest-level Platinum designation for bicycle friendly communities - led the delegation on a bike tour of Boulder's network of facilities. One of every 10 trips taken in Boulder is on a bicycle, which ranks among the highest rates in the nation. The Boulder Workshop was part of Bikes Belong's Bicycling Design Best Practices Project, which works to encourage bicycle use in America by adapting and implementing state-of-the-art international practices in bicycle infrastructure and urban design. Additional workshops and study trips for elected officials, planners and engineers are scheduled this year in Portland, New York and Northern Europe.